The Chinese were the single most important community that were the growers of vegetables on small farms or market gardens that supplied households and wholesale markets in the three cities. Vegetable gardening has a long tradition in China for thousands of years, and the Chinese in Sydney and Singapore brought their agricultural practices with them. Over the decades, urbanization and global city developments have increasingly encroached on market gardens and small farms at the fringes of urban centres. Supermarkets have gradually replaced the traditional fresh food shops. 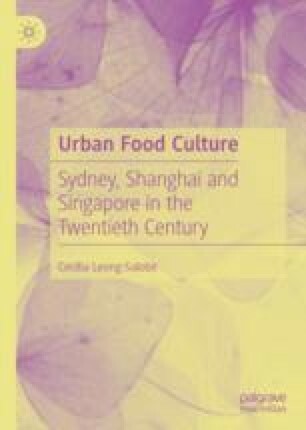 This chapter traces the historical development of market gardens and fresh food markets, and how globalization and other forces have precipitated in the advent of the supermarket. Census of New South Wales. 1901. https://www.records.nsw.gov.au/archives/collections-and-research/guides-and-indexes/census-musters-guide?searchterm=musters%20census. Accessed 28 May 2018. “History: From Night-Soil Buckets to World Toilet Day.” The Independent. 5 January 2014. http://theindependent.sg/history-from-night-soil-buckets-to-world-toilet-day/. Accessed 15 June 2018. Singapore Infopedia, National Library Board. http://eresources.nlb.gov.sg/infopedia/articles/SIP_613_2005-01-28.html. Accessed 1 Mar 2018.